My early Supro has a scarf joint that I assumed was a repair (see photo)...then I just saw this Collegian on ebay with a similar headstock joint. Perhaps it was a production technique. Anyone else see this? Hi Fred, got the same thing on my 37 charity shop duolian. I think Snakehips has mentioned it before, so it is known about. That is definitely not a repair. It was a production technique used in the 30s. Good to see he's still gigging. Enjoy the show and let us know how it went please. There's a video somewhere on youtube where Kirk Hammett makes a comment about the "Greeny" Les Paul which was generally wrecked when it was in the possession of the Irishman. 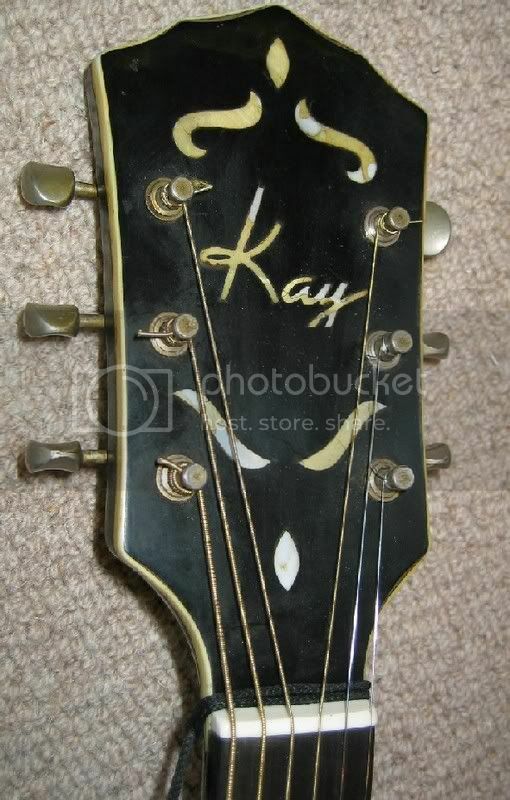 The headstock was reputedly broken during a car crash and was glued back on. Now, Hammett states in the video that there is a general concensus that a vintage Les Paul with a reglued headstock sounds better after the repair. Sounds to me that this is BS hype to try to keep repaired, so called "players", guitars values up in the stratosphere. On the other hand, it could be true - so my twisted logic then says that guitars with scarf joints should sound better than those without, n'est pas? Ergo, scarf jointed Nationals, Chinese made Epiphones etc. should sound better than '59 Les Pauls. Sorry for steering this thread away from the note cannons theme...but bonzo, Dave and band put on a great show. Dave is single-handedly keeping the Kinks flame alive. Almost all of the tunes were kinks tunes done with very tasteful arrangements. His playing was great...the hilight being an amazing arrangement of See My Friends. Thanks Fred, good to hear, now get back on thread! Lol! Dave is a lovely chap. Fred - I think you will find thatthat line in the headstock, which looks like a crack or a glued break, is actually the junction where the “sandwich layer” wood terminates on the headstock. The sandwich layer is a layer of wood, between the fretboard and main neck layers of wood, presumably with grain in a different direction to the main wood neck, to add stability. If you look carefully below the line in the side of the neck where the base of the fretboard is, you should also see another line running parallel to it, about as thick as the fretboard layer (plus or minus!). How did your restoration of this guitar go ? ?